Are you looking for a quick gift for your favorite yarn lover, or perhaps something to announce your own love of yarn to the world? I’m sharing a tutorial for how to make a handmade yarn with knitting needles ornament. With just a few supplies, including leftover yarn from your last crochet or knitting project, you can make this easy peasy ornament in less than 15 minutes! This project is part of Craft Lightning Hot Glue edition. This post contains affiliate links. I may receive compensation (at no added cost to you) if you make a purchase using these links. Yarn for this project was generously provided by Red Heart. A free review copy of Hot Glue Hacks and Crafts: 50 Fun and Creative Decor, Fashion, Gift, and Holiday Projects to Make with Your Glue Gun by Angie Holden and Carolina Moore was provided to me by Ulysses Press. Although I accept free products for review, I do not accept additional compensation, nor do I guarantee a positive review. My reviews are based entirely on my honest opinions. Before I share the tutorial, let me tell you a little about me and hot glue. My dad, who is a painter and photographer. He taught me basic painting and drawing skills. My maternal grandmother, who was an expert in all things needlecrafts. She taught me to crochet, sew, and embroider, and tried to teach me to knit, too. From time to time, we’d do some other crafts, like latch hooking. My mom, who is a masterful seamstress and can flip beat up old furniture into like-new beauties. She would decoupage from time to time, too. Nowhere in my childhood did I experience hot glue. As a relatively clumsy teen and then adult, I continued to avoid it. It seemed like I’d be tempting fate to put heat and glue anywhere near my flesh. Then, in January, I went to Creativation, the annual trade show for the crafts industry. Before the event officially kicks off, Angie from The Country Chic Cottage and Carolina from Always Expect Moore and 30 Minute Crafts host a night out for crafts bloggers. They had a hot glue project planned, and they patiently took me from life as a hot glue newbie into the world of the anointed. I didn’t burn myself (or anyone else) and I was pleasantly surprised by the results (and the speed). 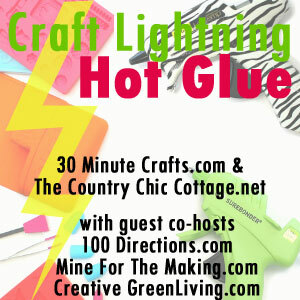 I’m sharing this story because Angie and Carolina recently came out with a book for hot glue newbies and pros alike! It’s kind of like having them both there with you, so if you’re intrigued by hot glue, pick yourself up a copy of Hot Glue Hacks and Crafts: 50 Fun and Creative Decor, Fashion, Gift, and Holiday Projects to Make with Your Glue Gun! Hot Glue Hacks and Crafts starts off with Glue Gun Basics, which tells you everything you need to know about different types of glue guns, glue, and accessories, while also sharing some great tips like how to avoid those little strings of glue that seem to trail off everywhere. The rest of the book is filled with projects, which are organized by type (for kids, home decor, holiday, jewelry, and entertaining). There’s also a Glue Gun Hacks section which shows you how to make stencils, stamps, molds, and faux geodes with hot glue, as well as how to etch with hot glue. This section includes a project for making your own stand, too, which is really helpful (and safer) if your glue gun didn’t come with a stand. There are also templates in the back for some of the projects. My favorite projects in the book are the lampshade, the stencils, and the stamped pillow. All of the projects include detailed progress pictures — just like what you’d expect to see in a blog tutorial — so even when the project isn’t something you plan to make, you can still pick up some hot glue tips and tricks. If you’d like to have the ability to make some quick handmade gifts for friends and family (and yourself), but also to learn how to really maximize your hot glue gun, I highly recommend Hot Glue Hacks and Crafts! As you might have guessed by now, the book is the inspiration behind this edition of Craft Lightning, where a group of bloggers share 15 minute craft projects. Here’s what I made with my glue gun! Now that you know where to get more information if you’re a hot glue newbie like I was just a few short months ago, let’s dive into the project! This yarn and knitting needles ornament works up quickly and it’s great for decoration or a gift. I got all the supplies I needed at Michaels using the Buy Online, Pick Up in Store option. ArtMinds Mini Glue Gun with Mini Glue Sticks, or your choice of hot glue gun with appropriately sized glue sticks. Creatology Wood Dowels, or a wood or bamboo chopstick. Creatology Wood Beads, or 2 small beads. ArtMinds Paper Mache Ornament, or any round, lightweight ornament. Red Heart Super Saver yarn (available at Michaels or RedHeart.com) in 368 Paddy Green, or approximately 20 yds (18.5 m) in any medium weight yarn. Sharp scissors or small craft saw. Split one dowel in half. I used a scissor to make indents around the center and then cracked it in half, but you could also use a small craft saw. Using the pencil sharpener, sharpen one end of each piece of the dowel to a point, like a knitting needle. Glue the beads to the un-sharpened end of each piece of the dowel and let dry. Glue the first knitting needle to the ornament and let dry. Glue the second knitting needle to the ornament so it appears to cross the first, by actually doesn’t touch it. Let dry. Glue the starting tail of the yarn to the ornament. Let dry. Wrap the yarn around the ornament, starting by covering the knitting needles, and being careful not to cover the ornament loop. Continue wrapping until the entire ornament is covered. Cut the yarn and glue the ending tail of the yarn to the ornament on the back. Let dry. I’d love to figure out a way to make a crochet hook version that doesn’t involve whittling wood. If you have any suggestions for making a mini crochet hook, let me know! If you enjoyed this project, you may like my DIY Locking Stitch Markers for Crochet and Knitting tutorial. Awww! So glad we could introduce you to hot glue! Thanks for joining! Love this knitting needle and yarn ornament! I am a craft show vendor (knit and crochet). This will make awesome gifts.